How is your medical provider supposed to get decades worth of information in less than 15 minutes with you? Providers are fighting an uphill battle do to their current framework of medicine. The ridiculous restrictions and policies that providers must adhere to make it nearly impossible to fully dive into the root causes of illness. If medical providers do not follow strict protocols developed by health insurance companies, they risk losing their license to practice medicine or be pushed out of their position in favor of a practitioner that can maintain a higher turnover for profit. Patients need to be aware of this broken, outdated and profit driven system to mitigate stress between themselves and their providers. The Department of Defense needs to adapt and practice medicine in the same way it does for war, in a cohesive team/group environment. You would not fight Unconventional Warfare (UW) with conventional tactics so why would we combat unconventional illnesses with conventional means (name it, blame it, tame it, bill it, refill it). Providers should have the ability to think outside the box to provide any means necessary to treat their patients. Providers need a new platform that can provide a broad scope of medicine to any patient without the costly and lengthy process of endless specialty referrals and deadly prescriptions with endless refills. Another issue with conventional medicine is the lack of communication, oversight and continuity between medical facilities, providers, and specialists. Service members are often bounced from provider to provider because of high turnover rates with staffing and often find themselves going in circles and starting over from scratch every few months with a new provider and a new list of prescriptions. Lack of continuity alone is a significant contributing factor to suicides, accidental drug overdoses and adverse drug reactions. The environment is a critical piece of both warfare and medicine. The Four Steps of Intelligence Preparation of the Battlefield/Environment (IPB/IPE) in the military are; Step 1. Define the Battlefield Environment. Step 2. Describe the Battlefield’s (Environment’s) Effects. Step 3. Evaluate the threats. Step 4. Develop threat Courses of Actions (COAs). Medicine should be no different. Diseases are the enemy within. If you understand these threats and how they affect you, you can build a solid defense against them and a strong offense to defeat them. As a provider you won’t have to ask what is wrong with a service member, you just have to look at how much he/she has been affected. You cannot live or work in the most austere environments in the worls and walk away with no type of health issues. One major issue hindering the treatment of service members and veterans is a general lack of situational understanding of deployment/occupational hazards that are unique to Special Operations. Special Operations Forces (SOF) work in the most extreme environments whether it is breathing 100% at depth diving for four hours or breathing 100% oxygen at 35,000 feet for hours before a high-altitude jump. Providers do not understand the strain on the body when you are flying over 120 MPH with over 150 LBS. of equipment on and a parachute deploys. Some service members have over 3,000 military free fall jumps. Static line parachute injuries are also a significant problem and service members who have hundreds of jumps are suffering through debilitating neck and back injuries. It only takes one bad jump to end a service member’s career. Ballistic helmets are heavy and the strain alone from constantly wearing a helmet on the ground is significant enough to cause injury. Imagine falling to the earth and what the impact from hitting the ground wearing a heavy helmet has on the neck. These injuries are often being overlooked and have the potential to damage the brain. Providers also have a tough time understanding what it means when a service member tell them that they were exposed to thousands of blasts from explosive breaching in confined spaces. Some Special Operations soldiers have been exposed to over 10,000 high explosive charges equal to or above a 1/4 pound of plastic explosives. A provider cannot even begin to understand what that means, or they think the service member is lying to them. Besides the occupational hazards, most medical providers are not fully aware of the dangers of certain medications used by the DOD carry the highest warning classifications for prescription drugs (black box warning labels). Prescription drugs like Oxycontin, Dilaudid, Seroquel, Ambien, Effexor, Cipro, Azithromycin, Mefloquine, Adderall, Paxil, Zoloft and other drugs that carry these black box warning labels for permanent neurological effects, brain dementia, mitochondrial dysfunction, psychiatric side effects and other debilitating side effects. These dangerous medications are often prescribed at the same time and the end user is rarely warned of the potentially life threatening adverse effects of mixing these drugs. Adverse effects from prescribed medications kill over 100,000 Americans every year according to the FDA. The most widely used anti-malaria medication of the last 20 years overseas is Lariam, or Mefloquine as military members know it, carries a black box warning for severe psychiatric events and permanent brain damage. Mefloquine is a psychotropic drug and can cause, quoted directly from the FDA Black Box Warning, “neurologic side effects may persist or become permanent.” “The neurologic side effects can include dizziness, loss of balance, or ringing in the ears. The psychiatric side effects can include feeling anxious, mistrustful, depressed, or having hallucinations.” Mefloquine attacks the limbic system. This medication was mandatory in Afghanistan for the prevention of malaria and soldiers were forced to take Mefloquine every Monday or they would face disciplinary action. Some service members took this drug for 14 deployments. Mefloquine is only one medication listed with a black box warning label and was, often, administered without the original packaging and patients were not properly screened prior to being prescribed the drug. Mefloquine is just one medication that carried an FDA Black Box Warning Label for neurological damage. Fluoroquinolone Antibiotics like Cipro also have multiple FDA Black Box Warning Labels for neurological damage and connective tissue damage. These drugs were also widely used during deployments to fight off bacterial infections. According to the FDA, Mefloquine is forbidden for use by pilots, directly quoted from the Federal Aviation Administration’s own Guide for Aviation Medical Examiners. Other medications often prescribed to service members carry warnings of suicide ideation and violence. According to a 2010 study, Prescription Drugs Associated with Reports of Violence Towards Others, the top 10 prescription drugs related to violence were prescriptions extensively used by the military. These included amphetamines, antidepressants, anti-psychotics and one antimalarial drug. Some of the drugs listed were drugs like Mefloquine, Effexor, Zoloft, and Paxil. These drugs are usually prescribed without any scientific proof or evidence of imbalances. Most of the time these drugs are prescribed with no MRIs to show brain damage, no laboratory tests to prove imbalances with catecholamines, neurotransmitters or hormones. The dangers of these drugs are rarely conveyed to the end user and some providers often use them off label or with little to no guidance to the patient. A lot of these drugs carry warnings of depression, violence, and suicide ideation. Soldiers are not properly warned of these drug’s possible adverse effects. Soldiers do not report the adverse effects because they don’t know that the drugs they are using can cause those adverse effects. Prescription drugs alone can cause additional health issues and will most likely result in more prescription drugs being prescribed. Prescription drug use is just as dangerous if not more dangerous than any obvious injury. The misuse, overuse and unnecessary use of prescription drugs must stop. Adverse Drug Reactions (ADRs) from prescribed medications kill over 100,000 Americans every year according to the FDA. The #3 leading cause of death in the United States is ADRs and hospital accidents which are killing over 250,000 Americans per year. Service members and veterans are still being prescribed these dangerous drugs and the health crisis in the DOD is still not changing. Hormone imbalances are common issues related to military service and they are not being looked at as probable causes for behavioral health issues. Low testosterone and thyroid disorder symptoms alone make up a majority of TBI and PTSD symptoms because the hypothalamus, pituitary, adrenal axis (HPA) is often damaged by TBI, heavy metals, chronic stress, and other environmental and occupational exposures. All these exposures can cause Hypothalamus, Pituitary, Adrenal (HPA) dysfunction and results in behavioral and physical changes in the body. Hormone imbalances can also predispose someone to PTSD by the mechanism of stress tolerance and how memories are stored during different states of the stress (helpless, hopeless). Hormones directly impact the decision-making process and determine how you react to stress. How come something so critical for health be overlooked as cause of illness? Hormones are also not checked prior to prescribing dangerous prescriptions by behavioral health providers. If hormones and neurotransmitters control every system in the body, why are they not being tested regularly as a probable cause of mental illness such as anxiety and depression? Anxiety is not a Xanax deficiency and depression are not an Effexor deficiency. Taking a pill to block or mask symptoms will never fix the problem, finding the root cause and fixing it will resolve health issues. “Diseases” and “syndromes” do not just manifest out of thin air, they are a result of imbalance and dysfunction throughout the body caused by environmental, lifestyle and genetic factors. Stress is proven to suppress immune function, sexual function, detoxification, digestion, hormone production, muscle development, insulin sensitivity, normal sleep patterns and cognitive function. 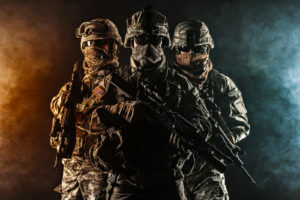 The military community lives in a constant state of stress (sympathetic activation) and the effects of this toxic environment are devastating and costing lives and money. The human operator is the most important piece of equipment the military operates. Every piece of equipment in the military has a training manual, operating manual maintenance plan and service life except for the human operator. How does the DOD not have a maintenance program for the most crucial piece of equipment in the military’s arsenal? How do we not have baselines on new recruits? How come we do not have a modernized system for regular diagnostic testing? You would never fly an aircraft for 20 years with an occasional checkup every five years, would you? So how can you expect a human operator to last 20 years running nonstop on low quality fuel, with damaged parts and no maintenance plan? If an aircraft or weapon started to malfunction would you just squirt some oil into it and send it out, or would you take the time to figure out the exact cause of malfunction, fix it and return it to service or throw some fluids in and send it back out? Why would medicine be any different? The human operator is not much different from any piece of military equipment. Experience cannot be manufactured or programmed and losing experienced service members to preventable health conditions is unacceptable. If our equipment malfunctioned as bad as our service members, it would be deadlined and labeled non-mission capable. Every service member should have a maintenance plan, service life and service log just like any other piece of equipment in the military. Every service member should have a full overhaul after a certain amount of time in combat or training. If keeping a soldier healthy for 20 years is not possible, the DOD either must cut the service life down or implement a new maintenance program. Would the military save more money in prescription drug costs for retirees if the retirees were healthier at the age of retirement? Would suicide and cancer be as prevalent with less exposure to chronic stress and dangerous and often unnecessary prescription drugs? The annual DOD budget for prescription drugs was over five billion dollars in 2014 and continues to rise every year. The DOD should be trying to cut that prescription drug costs in half by getting service members and veterans off them. A simple, cost effective plan to make the force healthier, happier, stronger would cut the use of prescription drugs down and save lives. The implementation of Person Oriented/Precision/Functional Medicine can provide that solution. You cannot expect any service member to perform optimal with sub optimal health and sub optimal health care. Functional Medicine provides optimal health care by teaching individuals how to repair and maintain themselves by mastering their environment and lifestyle and working around any genetic predispositions they could possibly have. Functional Medicine is the Individual Field Manual (FMI) and Training Manual (TM) that is missing. The goal of Functional Medicine is to provide service members with the knowledge to obtain and maintain optimal health, performance and overall wellness by maintaining and repairing themselves. The exorbitant cost of prescription drugs and the astonishing numbers of suicides and cancer are both proof that the current medical care model is not working. Life expectancy has dropped for the second year in a row in the US. The #3 leading cause of death in the United States is now the health care system. Adverse drug reactions and medical errors are killing over 250,000 Americans a year. Why does the military continue to feed the current medical care model and prescription drug machine with billions of dollars if it is obviously not working and killing over 250,000 people a year? Why are leaders and healthcare providers not concerned with a nearly seven billion-dollar, annual prescription drug cost? Why are good soldiers being tossed on the curb without being evaluated or treated properly? Why are good soldiers falling apart a few years prior to retirement? Military leaders and healthcare providers should be able to identify the difference between a “bad soldier” and one who is performing badly because he/she is physically, mentally or emotionally injured from war. These are questions that people should be asking our military leaders and politicians. Until leaders can identify underlying issues and take the correct approach to solving them, service members will continue to be medicated or will revert to self-medicating and put themselves, their families, their teammates their careers at significant risk. Unconventional Warfare (UW) works via unconventional forces operating By, With or Through indigenous forces to train, assist, advise and equip a resistance movement. The resistance force works organically to overthrow oppressive regimes with minimal support from conventional forces. When UW fails, conventional forces are brought in and use overwhelming force to overthrow the enemy (the sledge hammer). Conventional medicine should be used the same way, when the body cannot fight and conquer diseases organically, acute medicine should be used as necessary to reestablish health. Functional Medicine is the UW of medicine. Functional Medicine providers train, assist and advise their patients to overcome preventable health conditions and work by, with and through conventional medical facilities/practitioners to resolve multifaceted health conditions together. Functional Medicine is an operating system that utilizes existing resources to identify the root causes of dysfunction (DIS-EASE). Preserving the force with Functional Medicine does not require years of research or new facilities, it only requires the DOD to embrace a new paradigm for all its war fighters and their families. It is with solid conviction and enforced by personal firsthand experience that I know Functional Medicine provides a framework for this very shift in paradigm. It truly is the future of medicine that we have access to now. It simply takes an embracing of a mission whose objective is to bring about the highest levels of wellbeing possible to all those who protect and defend our great nation. We must gracefully relinquish rules of engagement that as of today no longer match the terrain that it once did. It is time to step toward a more powerful projection of care and embody the leadership and ownership of one’s own health. We owe it to all those before us and those who brought us here to bring forth a system of care that preserves the lives of those who stand ready for the call. Kangmin, Zhu (2010). Cancer Incidence in the U.S. Military Population: Comparison with Rates from the SEER Program. City Name: Publisher Name.